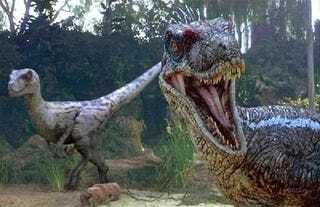 Just one more reason to fear Jurassic Park: a new study has found that, unlike modern-day reptiles, dinosaurs were likely warm-blooded. It's a trait that suggests dinosaurs were far from lumbering reptiles, and were actually quite the prehistoric athletes. The study, published in PLoS ONE, looks at whether dinosaurs were ectothermic (cold-blooded), like modern-day reptiles, or endothermic (warm-blooded) like birds and mammals. Endothermic animals are more athletic than ectotherms, and are better able to survive in colder climates. But the payoff is that endotherms must consume more food than ectotherms because of their higher metabolisms. Thus, the study authors examined the physiology of dinosaurs to determine whether the energy they would have expended exceeded what an ectothermic system could supply. Herman Pontzer of Washington University in St Louis has studied the relationship between the cost of locomotion and the length of an animal's leg. He has found that length of leg predicts the cost of locomotion with 98 percent accuracy in various land mammals, and estimated the length of various dinosaur legs based on fossil records. He and his colleagues looked at anatomical models of 14 species of dinosaur and compared the estimated cost of locomotion with those of modern-day endotherms and ectotherms. They found that the cost of locomotion was similar to that endotherms experience, and that walking and running would have consumed too much energy for dinosaurs to be cold-blooded. The findings suggest that dinosaurs were, in fact, powerful athletes — and that they needed a constant supply of food to maintain their energy.